Are you looking for something fruity to serve up for the family? Something sweet with lots of natural and healthy flavourings to it? Something also full of fabulous colours. This has to be one of the simplest and most impressive puds when you have large groups of friends or family to entertain. How pretty and tasty does this look too? Also full of healthy ingredients including pears, plums and blackberries, yum yum!! 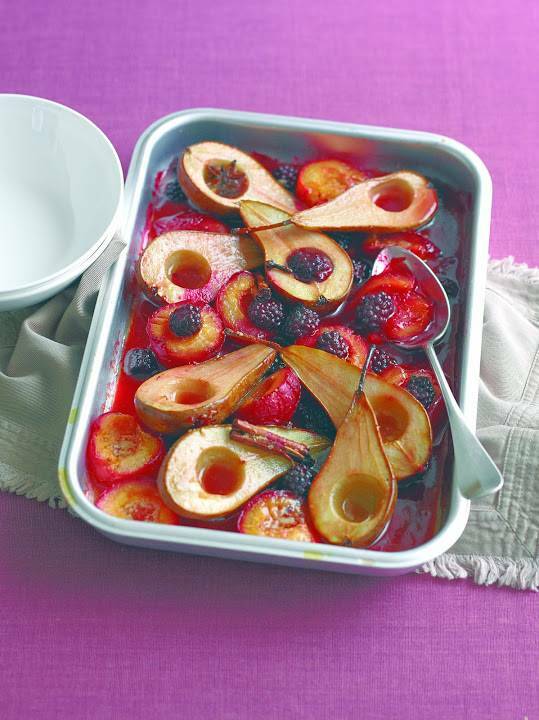 Arrange the pears, plums and blackberries in a roasting tin. Sprinkle with the cinnamon, cloves and star anise. Spoon the orange juice over, dot with the butter then sprinkle with the sugar. Bake in a preheated oven 190°C (375°F) Gas Mark 5 for 20-25 minutes until lightly browned. Serve hot spooned into bowls and topped with a scoop of vanilla ice cream or spoonful of crème fraiche, if liked. Experiment with different fruits such as peaches and nectarines. Do you like making fruit dishes up? What do you think fancy trying this Roasted Orchard Fruits recipe? Love to hear your thoughts, let me know if you get to make this dish up. Would you like to see more fruit recipes here? Let me know if you do and I will see what I can do! "Octopays Game over At Ladbrokes …"
Super easy to make, but it looks soooooooooo colorful and deliciousI LOVE this idea!! Great presentation Clairejustine. Looks so good.